Analyses a regular or hybrid grid model and generates an approximating TIN surface based on a coarse-to-fine approach. 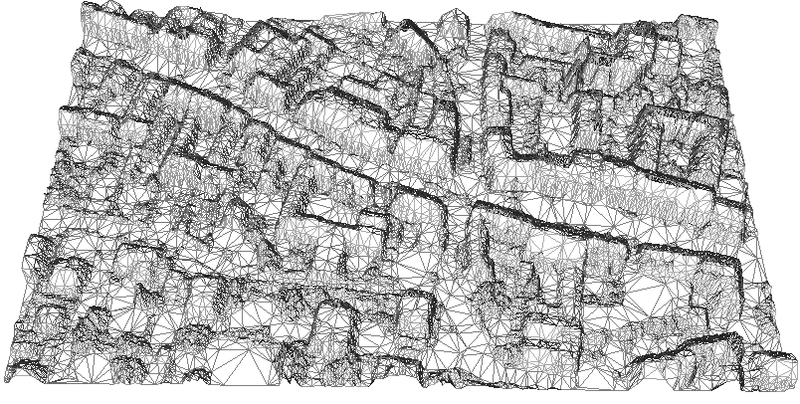 Due to the high amount of data provided by ALS sensors, the simplification of surface grids (DTM, DSM...) derived from dense ALS point clouds is an important issue, above all for data delivery. To condense the data contained in high resolution ALS grids, it is necessary to analyze the surface and preserve all relevant surface features while, at the same time, generalize the surface as much as possible. Module Simplify uses a mesh refinement approach to iteratively refine an initial coarse grid. Within the refinement loop, additional vertices can either be inserted hierarchically or irregularly (parameter division). In case of hierarchical division, the grid cell is divided into four parts in each pass, if a single grid point within the regarded area exceeds the maximum tolerance resulting in a quadtree-like data structure. By contrast only the grid point with the maximum deviation is inserted when using irregular division. Higher compression rates (up to 99% in flat areas) can be achieved with irregular point insertion, whereas the hierarchical mode is characterized by a more homogeneous data distribution. Figure 2 shows the different point distribution based on hierarchical and irregular division. The input grid model file is expected in aGDAL supported data format. 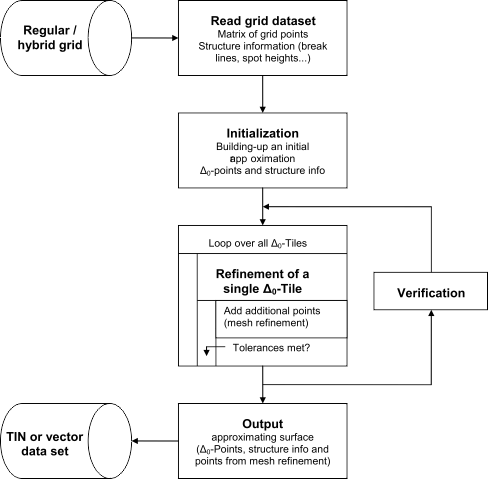 The simplified surface is stored as vector or TIN dataset depending on the output data format. Estimation rule: input file name + '_simpl' + <.ext>.Please note, that a correct representation of the approximated surface is ensured for TIN output only. In case of vector output, only the vertices and edges can be exported and, thus, reconstructing the surface from these points/lines may not lead to the same approximating surface and the adherence of the maximum height threshold can, therefore, not be assured. Estimation rule: The output format is estimated based on the extension of the output file (*.tif->STL, *.d45->REB, *.dxf->DXF ...). Hierarchical division: grid cell is divided into four parts resulting in a quadtree-like data structure. Irregular division: only the grid point with the maximum deviation is inserted. Higher compression rates can be achieved with irregular point insertion, whereas the hierarchical mode features a more homogeneous data distribution. In case the input terrain model includes line information (structure lines and/or border lines, a regular vertex spacing along the lines is often useful to avoid thin triangles and/or long triangle edges. Estimation rule: If not explicitely specified, 4*DTM-grid-width is used as line densification interval. Setting line vertex distance to zero supresses line densification at all. The line buffer distance denotes the width of a band around structure lines of the DTM. Within the band all eventual grid points are removed to avoid small and odd-shaped triangles. Estimation rule: If not explicitely specified 2*DTM-grid-width is used as buffer disctance. A perspective view of the resulting TIN is shown in Figure 3. Mandlburger, G., Hauer, C., Höfle, B., Habersack, H. & Pfeifer, N., 2009: Optimisation of lidar derived terrain models for river flow modelling. Hydrology and Earth System Sciences, 13 (2009), S. 1453 - 1466.